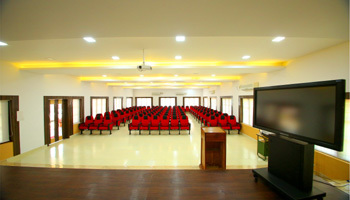 Mar Athanasius International School contains two meeting rooms of varying sizes. The rooms are spacious and well lit, the furniture is comfortable and flexible, and the decor is simple but pleasant. Rooms can be adapted for various uses including lectures, seminars, workshops, conferences, professional meetings and boardroom meetings. The 1,500-square-foot lecture theater/multi-media room located on the ground floor features theater-style seating for 100 to 125 and state-of-the-art distance-learning capabilities. 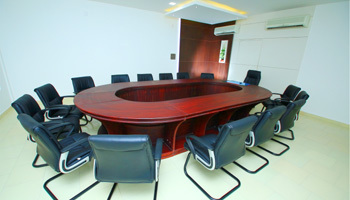 The conference room is equipped with all the state-of-the-art audio-visual conference equipments includes overhead projectors, projection screens, back projections, interactive LED screen, mike system and computer. The hall is fully air conditioned and has access to hi-speed internet connection. . It is a popular venue for School events, such as workshops, seminars, conferences, student performances and competitive exams. Located next to the conference hall on the ground floor, this 500-square-foot space accommodates approximately 15 people in an oval shape configuration. The room is fully air-conditioned and equipped with all the gadgets for conducting board meetings, special lectures and group discussions.